Oh you girls (as my Gran used to say); such lovely comments regarding my felt heart garland in my last post. Bless you, thank you! I do feel a bit of a fraud as it came together quite quickly and supremely enjoyably! Now, some weeks ago, a little card came through the letterbox announcing the arrival of a new and very local wool shop! Wool shops are extremely thin on the ground in my neck of the woods I can tell you, so I was quite thrilled about the prospect of going shopping when it opened yesterday! I might have 'learnt to crochet' some time last year but I'm still finding my feet with regard to yarns. To be honest, I have absolutely no idea as to the technical difference between 'double knit', 'worsted' and 'aran' weights. I'm only just discovering the merits (or not) of acrylic versus cotton versus silk, blah de blah. To date, I have ordered the majority of my yarn from the internet where I can commit my crochet crimes in safe anonymity. So, yesterday, it was with a teeny bit of trepidation that I went to buy some yarn in person. Would there be crochet police around the perimeter, ready to pounce? Worse, would there be three middle aged women who had 127 years knitting and crochet experience between them, grilling the shoppers on how they sew in their ends? Would I be timed on how long it took me to complete a 6" square of treble stitch before being allowed to cross the boundary? Of course, there was none of that; the staff were kindly, and I had the most wonderful browse and eventually selected a small pile of Debbie Bliss Cashmerino and Sublime, a mixture of double knit and aran, simply because I liked the look and feel of them! And, yes, I had every intention of using them together. Because, when you learn any craft, that's what's important isn't it? It's all about finding your own way. There aren't really any rules. Are there? I wish you all a wonderful weekend but not before showing you my sweet violas. The colours are so pretty they leave me weak with delight. Your post made me chuckle - the crochet police! lol! How lucky are you to have a wool shop opening, wool shops are few and far between! The wool you chose is gorgeous, looking forward to your makes! Heather, how neat are your stitches? 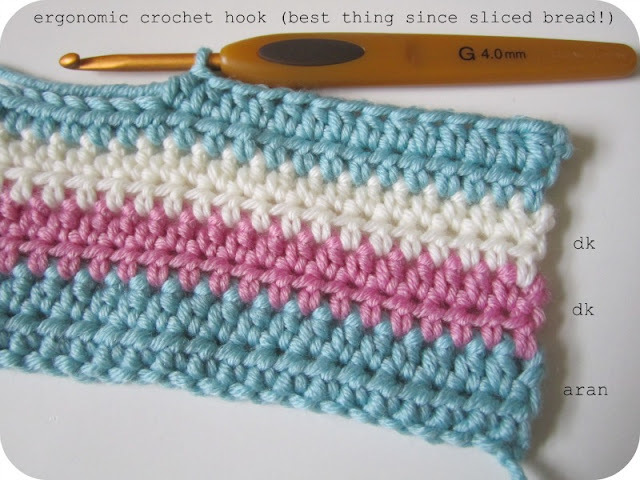 For some reason I am neater with my Brittany hook than with metal, I think because the former is longer, not sure. Saw those hooks you've got, are they good? Oh lucky you having a shop so near, I love the internet but there's nothing like squeezing a ball (steady!!!) in your hands before you buy. I've used all of the wool you got and they are lovely to work with. Stop being so talented y'hear, I'll make you eat cake! Oh that crochet hook looks really comfy!! why can't they make them in pretty colours though!! It would look so much nicer in pink or pale blue! We are lucky - we've a good little shop in town and another in the next town too. I LOVE the sublime yarns, they are soooooo soft, and the colours are sooooo gorgeous! I wish you joy to use them. The more you explore different yarns, the more you'll find the ones that work for you for different projects. Oh what lovely yarn, Sublime is my favourite it is simply, well sublime. Gorgeous colours too. I am using aran and dk in my next project because basically I can't find the colours I want in either or! Hi Heather, we are on the same level with crochet, I bought wool online that was just OK but having a good feel is great, I buy for colour and texture without reading labels haha. 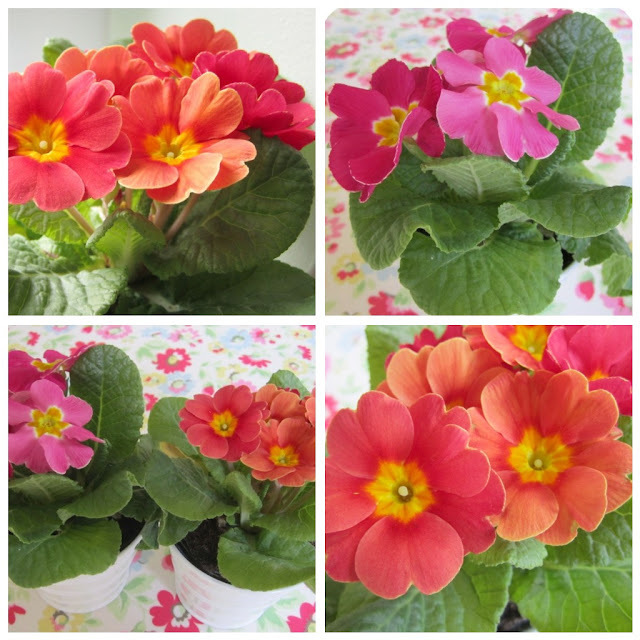 Your blog is blossoming with colour...lovely primulas! Gorgeous yarn. I always just go for whatever I like, rather than what the pattern calls for. This has led to me making the most enormous pot holder in the world - I'm actually thinking of turning it into a cushion cover instead it is that big! 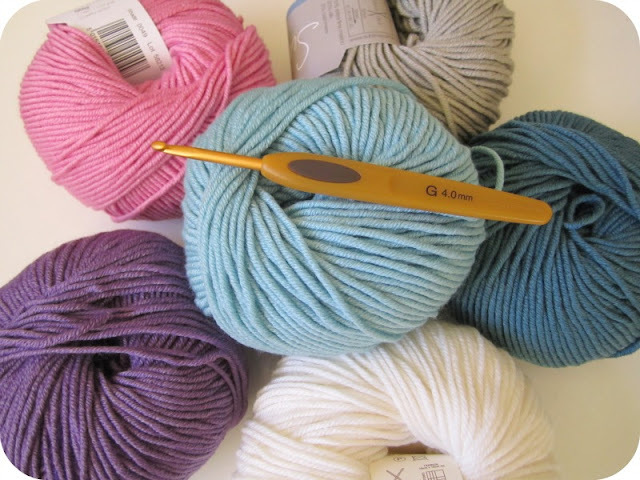 Re your comment on my blog about knitting - if you can cast on you have done the hardest bit (well, that's what I found hardest to master anyway). YouTube has some fab tutorials which made it all very clear. Persevere - it's a good excuse to buy more wool! !